If you collect antique Native American baskets you will not want to miss this show. The annual Marin Show: Art of the Americas celebrates its 26th year in February, as the most substantive and extensive ongoing showcase focused on the indigenous arts from across North, Central and South America. The show, produced by KR Martindale Show Management, is described as the “Superbowl of Native American Art collecting”, bringing together top and passionate dealers, collectors, artists, and academia from across the world. A staple of the Marin Center's annual programming, the show's main floor focuses on antique material, with the adjacent hotel ballroom showcasing contemporary art and native artists. The exhibited art includes pottery, textiles, sculpture, jewelry, beadwork, baskets, paintings, photography and more, ranging in price from the low hundreds to $1,000,000, so as to offer quality material to buyers ranging from first time buyers to seasoned collectors. The Marin Show works in association with the Antique Tribal Art Dealers Assoc., The Marin Museum of the American Indian, The Miwok Archeological Preserve of Marin, Tribal Arts Magazine, American Indian Art Magazine, and Western Art Collector Magazine. The 2010 Marin Show: Art of the Americas is an anchor event for the First Annual San Francisco Tribal Arts Weekend. In partnership with the San Francisco Tribal & Textile Arts Show (SFTTA) and the Marin Show Art of the Americas (MSAA), San Francisco Tribal Arts Weekend is the largest and most significant gathering of Tribal Arts dealers and collectors in the world. San Francisco Tribal Arts Weekend visitors will gain admission to both shows (MSAA, SFTTA) with the purchase of one ticket ($15) at either show. Tickets available at the door. 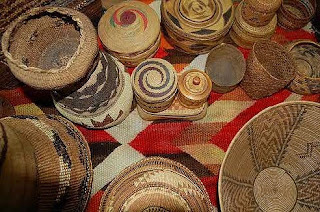 Of particular interest to basket collectors will be participation of dealers such as Natalie Linn and Elaine Tucker, Turkey Mountain Traders, Jerry Weisberg Tribal Antiques, Terry DeWald American Indian Art, Spirits of the Plains Gallery and numerous others. Basket makers will enjoy the lecture and book signing: Basketry Plants of Western North America by renowned California basket maker, collector and teacher, Justin Farmer. Mr. Farmer served on the Board of Trustees of the Southwest Museum of the American Indian, The Autry Center, in Los Angeles, and he is a member of virtually every Indian museum in Southern California. Mr. Farmer will discuss his new book at Embassy Suites at 12:00 pm, Saturday February 13, 2010. Attendance is free. $15 two-day admission. Allows free admission to San Francisco Tribal & Textile Arts Show. For additional information, please visit www.marinshow.com. For more on basket collecting be sure to visit BasketMakers.com.